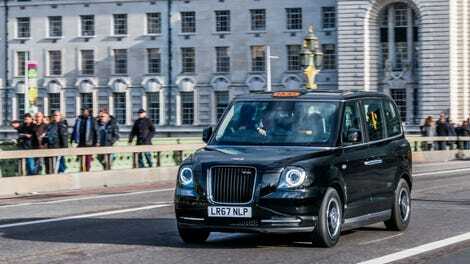 Providing passage for the tired, tipsy, and busy, the Black Cab is as much a part of foggy London’s furniture as the red phone boxes no one uses. Thing is, the cabs you’re used to seeing aren’t very efficient, comfortable, or spacious. So the LEVC (London Electric Vehicle Company) TX has cooked up a new one. To get why the new one is such a big deal, it’s worth having a look at the car it replaces: the LTI TX4. Powered by a rough diesel motor and built to a minimal budget it served its purpose, but as I was told by LEVC, it was built to meet the minimum standards for emissions, etc. whenever the goalposts were moved, not to exceed them. Before now there was little budget, little investment, and a limited market for it. While its rough ride, squeaky panelling, and tractor soundtrack were a comfort at two in the morning on a Saturday after five too many tequilas, it was less fun the next morning with a stinking hangover. The car was only part of the package though. To become a licenced London cabbie you need to take The Knowledge, the most fearsome driving test in the world. To pass you need to memorize all of London’s streets, and how best to navigate them. No matter how good your GPS is, knowing literally every street in a city is better. The question is if this hybrid makes your life as a London driver easier, if the new tech and design is a genuine improvement. A shiny new range-extended EV cab for the cities of the world, that’s what it is. 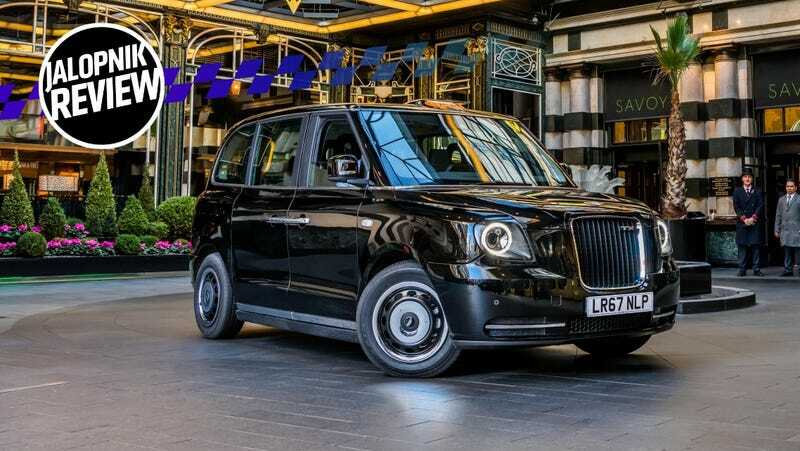 Thanks to investment from Geely (they of making Volvo really good and buying Lotus), some actual cash was pumped in to development so it could be not only ‘the new London taxi,’ but a well thought-out vehicle. Despite its oddly boxy appearance, it’s still recognizable as a London taxi. Scoff at that all you will, but during testing the team took a heavily camouflaged car to the streets of London to see how it’d do on the city’s (genuinely chuffing awful) roads. Even with no stickers and no ‘TAXI’ light on its roof people tried to flag it down. It got the shitfaced Londoner seal of approval then. It’s been designed to offer more space than the old car, and be more accessible for the people who need to use it. As such it’s taller and longer than the TX4, though not wider. Pushing the sides of the car out and making it more boxy and less eggy means more head and shoulder room for rear passengers, so you can now fit three abreast comfortably on the rear bench. (It wasn’t in the TX4. Trust me.) You can also fit three folding seats ahead of it, and the extra space also means there’s room for a wheelchair if it’s needed. In terms of accessibility pretty much everything has been thought of. There’s a wheelchair ramp built in to the floor of the TX, so getting a chair onboard is easy. Various touch points like grab handles and seat edges are finished in bright yellow so those with sight impairments can more easily identify what’s where in the cabin, the floor, and seat base carpets are different colors for the same reason. If you’ve got kids and child seats with you there’s all the right fix points for them to travel comfortably as well. The color scheme inside is a mix of grey, black, and yellow, so don’t expect to be dazzled by it, but a panoramic roof does lighten things up a touch. Being a car there’s more to the TX than the rear, though it’s the bit the vast majority of us will sit in. There is, in fact, a drivers seat. Up front you sit behind a wheel that looks suspiciously like something you’ll find on a Volvo, and within your eyeline is an infotainment screen that could have fallen off a V90. No surprise really, the Geely family is big and parts sharing isn’t a crime. It sorts the major ‘car’ things like A/C and whatnot. If you want a passenger up front, tough. The rear cabin takes priority, but it does mean there’s a handy space for a suitcase if the job requires it. Much like the rear it’s not pretty up there. There aren’t any design touches plucked from the wild elucidations of a tortured artist, just clever use of space and materials that are going to last long in to King Charles’ reign. The TX is a range-extended EV, so there’s a 1.5-liter three-cylinder gasoline motor from Volvo hidden within to provide power for the car’s 110kW electric motor. Its top speed is limited to 80 mph thanks to Transport For London, the governing body of transport… in London. With a claimed 229 horsepower and 376 lb-ft of torque on tap (combined), there’s enough go for sure, but weighing in at 4916 pounds, it’s not exactly quick. Going 0-62 mph takes a stately 13.2 seconds. LEVC’s official figures reckon it’ll get 80 miles from a full charge and up to 377 with the range extender doing its thing at full chat. In the real world, I’m told you can expect 60 miles EV and closer to 300 miles with petrol assistance. Fuel economy is the big winner here. The old diesel got 27.6 mpg. The new car gets a claimed 180.9 mpg, though that does fall to a comparatively tiny 30.6 if you don’t plug it in and only rely on the range extender, mind. With the right charger you’ll get 80 percent battery power in 25 minutes. It’s the emissions that’ll help the TX’s case further: 29 g/km CO2 with the range extender used, none without, compared to 222 g/km from the old diesel cab. NOx? That’s 0 mg/km versus 44. The space in the rear is just wonderful. After a long day at work or a solid night of binge drinking stretching out in the back of one of these will be something of a treat. As ‘proper’ cabs aren’t all that affordable to use on the regular (TFL regulations drive up prices), it ought to be a treat. Are you one of those heathens that lets their phone battery dwindle to nothing? Well, the TX has that covered. There are USB ports, proper plug sockets, and even WiFi so you can work on the go as well. It’s comfortable. There a few cars where the rear seats are directly above the rear axle, this is one of them. You’d expect this to mean spine pain, bumping and jumping, and all sorts of misery. Not so. Black cabs have a party piece: the turning circle. It can do a full about face in an 8.5 metre gap thanks to its front wheels being able to turn to 63 degrees. That’s the kind of steering angle you find in professional drift cars, not your average car on the road. Composite panels make it easy to fix, which is a bonus considering most of London’s drivers are perhaps slightly accident prone. If you get one of your panels bashed or scraped you can get them changed over in a matter of hours, rather than days. It’s vast. From a driver’s point of view, threading it through London’s narrow streets can be sketchy as sin. It can be a bit nerve wracking with the city’s particularly cavalier bicyclists, let alone the absolutely unhinged people on mopeds, and then all of the pedestrians staring at their phones rather than where they’re going on top of that. Yes, it looks like a London taxi, but it’s definitely not objectively pretty. It’s a triumph of function over form. What it can do is impressive, which is as complimentary as I can be. It felt odd being in the hotseat of cab considering the amount of time I’ve spent in the back as a dribbling mess. The driving position is high, requiring little me to take a bit of a step up to get to. Once I’d adjusted the seat, mirrors, and wheel, I was hot to trot. Thanks to the high position I could see pretty much everything around me, even London’s crazed cyclists (I am one on occasion—they can be woefully stupid at times) whizzing up the nearside. Slipping the car into drive, I silently moved away from the kerb and went stalking around town. Power delivery is, as you’d expect from an EV, smooth as silk. It feels quick, too. I’m told it could be a pretty tasty traffic light dragster, but speed was sacrificed for range. That is, when you think about it, right considering the car’s job. There’re a few regen options to choose from: none at all so the car acts just as ‘a car,’ a lower regen setting dragging the car slightly when you take your foot off the pedal, or a higher regen option that means you don’t need to use the brake at all. Simply lift and the car will slow itself in the process of reclaiming energy. Neither of the regen options jar the car, so when you do choose to nab a few electrons here and there you won’t piss off your passengers. It’s good for adding a couple of miles during a shift, apparently. You can keep an eye on your charge, how well the regen is working and suchlike on the digital instrument cluster. You can also chart your energy efficiency on the massive infotainment screen. Braking, if you choose to, is pretty solid. Though driving around London’s streets if you look far enough ahead you’ll never need to use them in a hurry. They’re smooth and easy to fiddle with, so ideal for ferrying people around the side streets of Britain’s capital. Seeing as it’s a car for town driving, you’d expect its sizable dimensions to be a bit of a nightmare. Alright, my bum did get a touch squeaky down tighter streets, but because the sides are flat and visibility is good it wasn’t as scary as first expected. It also turns on a dime, as cabs should. Its turning circle is unreal thanks all that steering angle. If you need to pull a u-turn in a hurry there’s no vehicle better. There are a few drive modes to pick from. Pure EV does exactly what you think it does, auto regen will decide how best to get energy back in to the battery, and there’s a top up mode which keeps the range extender on while you drive to ensure the battery stays brimmed. The first two are ideal for town driving as they’re as green as you can get (considering London is full of pollution), the third is a smart one if you live out of town. See, taking your cab home of an evening is the done thing, and most people who work in the city don’t live in the middle. So driving your cab home, charging it, and using all the energy to get to work isn’t ideal. Keeping the range extender on to keep yourself topped up until you get to work is smart idea. It’s not pretty up front, but it’s designed to last. Anyway, you’re not going to be looking at the dials and what have you, you’ll be looking for fares. Man, it is smooth back there. Fine, Bentley isn’t going to be asking for notes, but park your arse on the rear bench and you’ll not be bothered by lumps and bumps too much. The suspension is quite bouncy, so over speed bumps you may rebound a little, but that’s about it. The sense of space back there is ace thanks to the panoramic roof, too. Combine that with the quiet motor and decent sound deadening and it’s honestly easy to forget you’re in a cab at all. Especially if you do what everyone does when they’re in a cab: eyes down, stare at phone, wait until you’re home. If you’re with mates you can easily have a conversation at a normal level. The old cabs were noisy, not very comfy, and hard to have a natter in. This new one is a revelation in comparison. There are many fees associated with being a London cabbie, but the car itself will set you back $73,659. Not a small amount of money, but that’s the price you pay for cutting edge tech in this field. There are also some pretty huge fuel bills to be saved on thanks to its powertrain, so it kinda works for you. Sadly, there’s no plan to make a consumer-focused version just yet. (You can buy the cab, as our friends at Smith & Sniff note, but you’re buying one as-is. There’s not one that focuses on being used as a full fat family car.) A shame, because it would make a pretty stonking family car for city-based Catholics. As a car it’s smart, does everything it needs to do for everyone it needs to do it for, and it’s a decent drive. It won’t set your hair alight in the corners but it’s not supposed to. It’ll keep you comfy for a shift and doesn’t appear to be too much of a faff to keep moving, seeing as London’s charge infrastructure is growing daily. For passengers, it’s ace, frankly. It’s more expensive to ride in than the likes of Uber, but what you get for your money seems to be worth it. A new cab for a new automotive era. I look forward to falling in to one at 2 a.m. any day now.